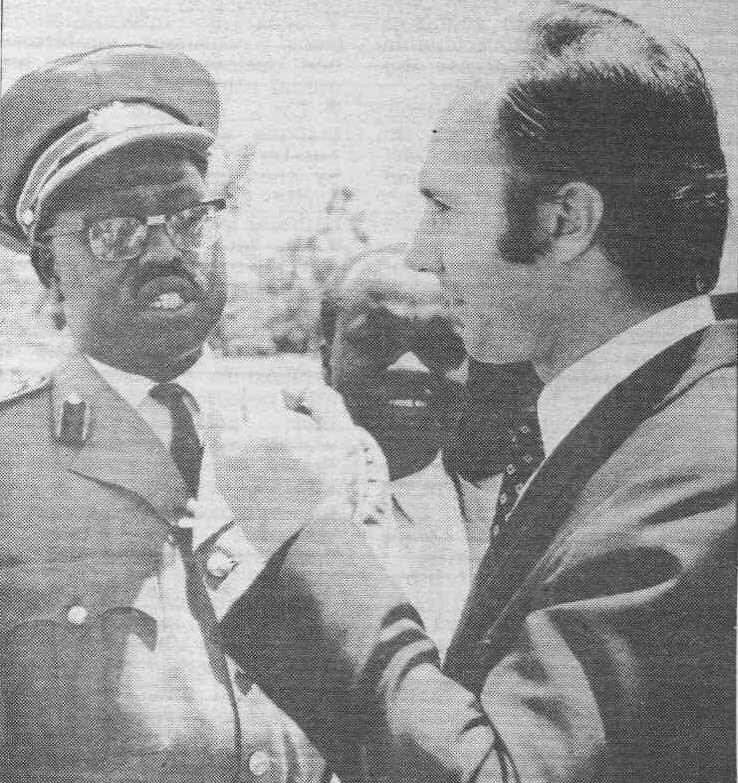 Feb 21, 1972 - Hazar Imam met with President Idi Amin at His Kampala lodge. At a Press conference at Entebbe Airport, Hazar Imam said; "It is the policy of my community in Uganda for many years to be part and parcel of Uganda and identify themselves as Uganda citizens. 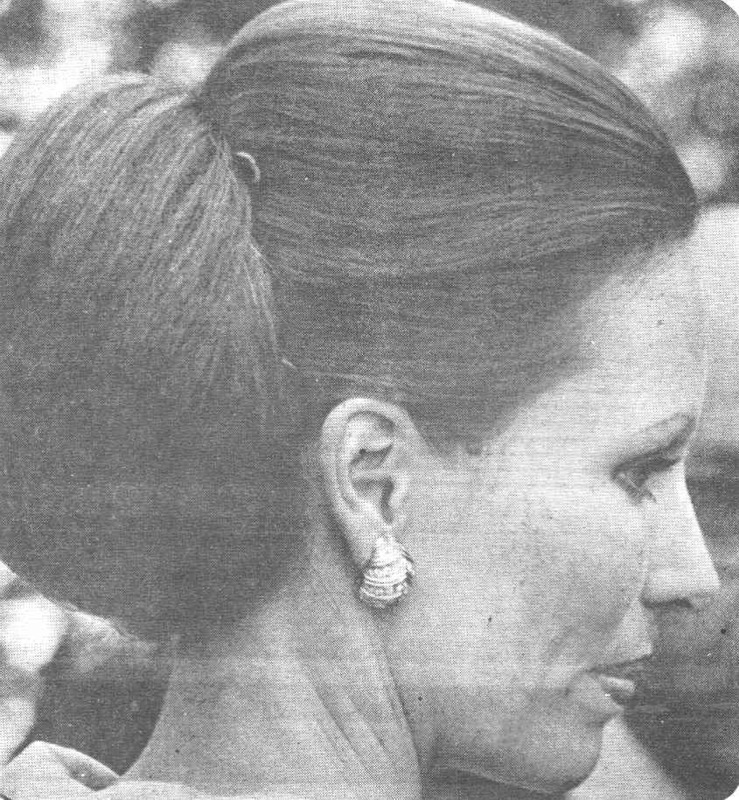 (click here) Hazar Imam was accompanied by Begum Salimah and Prince Amyn Mohammad. 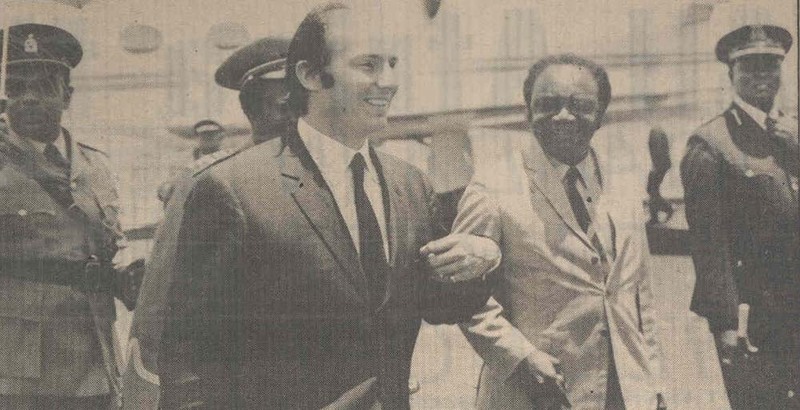 February 23, 1972: Industrial Promotion Services (Uganda) Ltd was established. 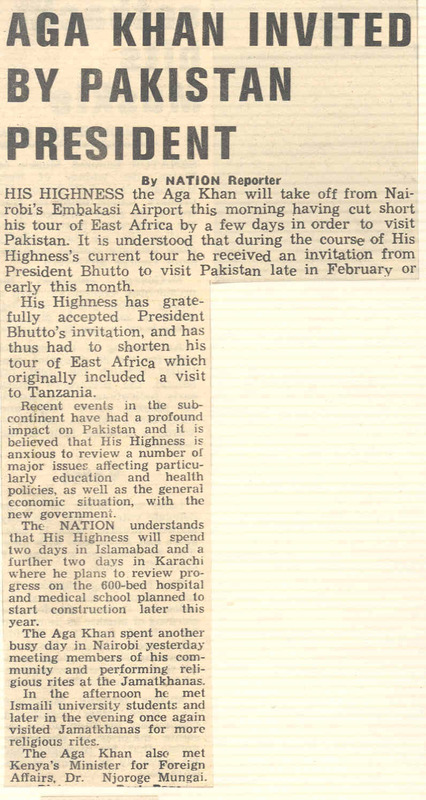 March 9 - 13, 1972: Four-day visit by Mowlana Hazar Imam to Pakistan. In Islamabad, held discussions with Federal Minister of Education, Secretary of Federal Ministry for Tourism and members of Pakistan Tourism Development Corporation. In Karachi, attended a dinner hosted in His honour by Mr. Mumtaz Ali Bhutto, the Governor of Sind. In Karachi, Mowlana Hazar Imam hosted a dinner for Raja Tridev Roy, Federal Minister for Tourism, and other official of Pakistan Tourism Development Corporation. 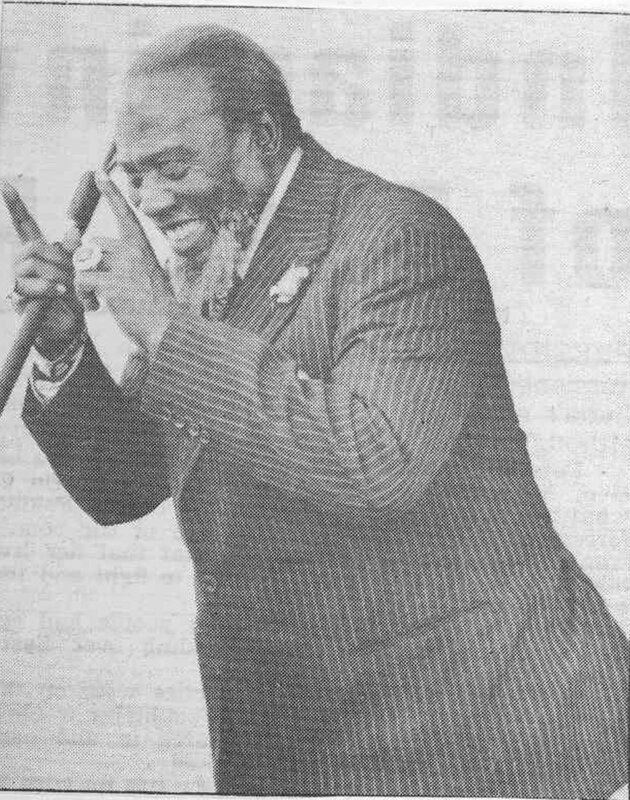 Mowlana Hazar Imam attended the Durbar and met the Jamat. 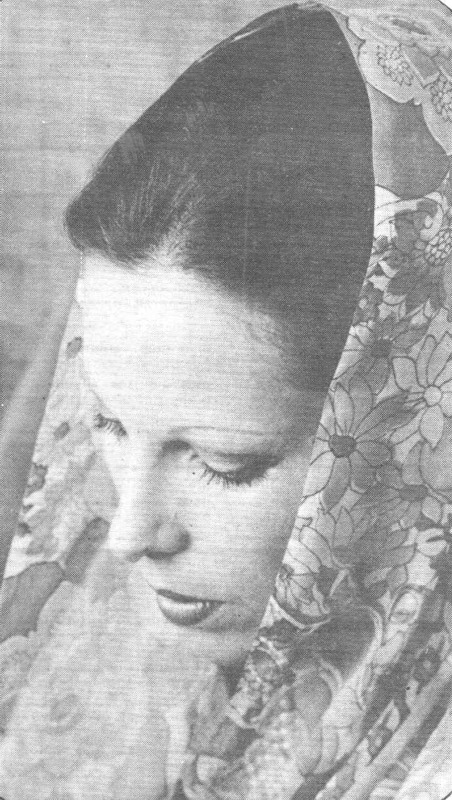 March 23, 1972: Visited Syria at invitation of the President. 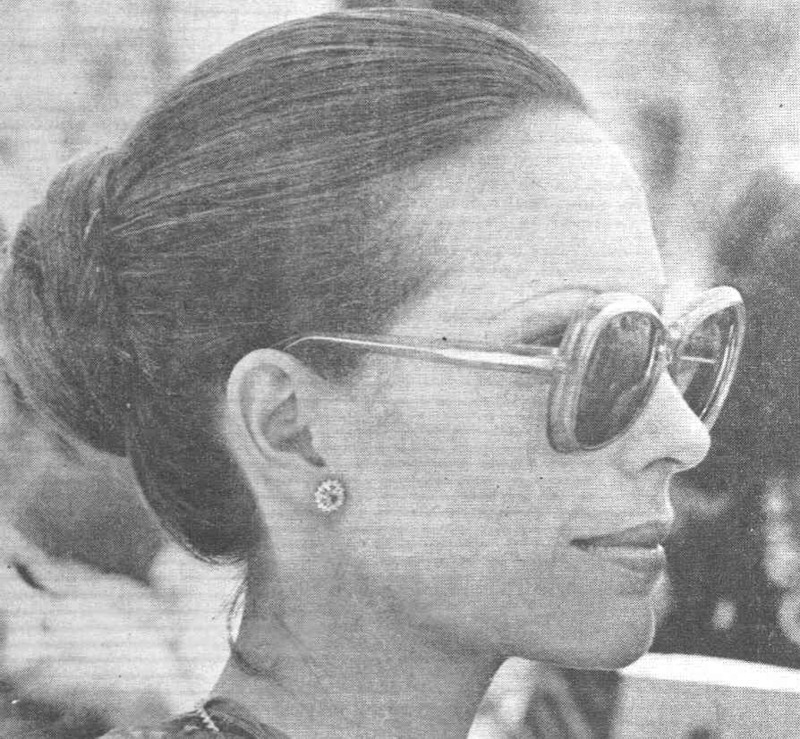 July 1972: In the news "From Sardinia to Paris". 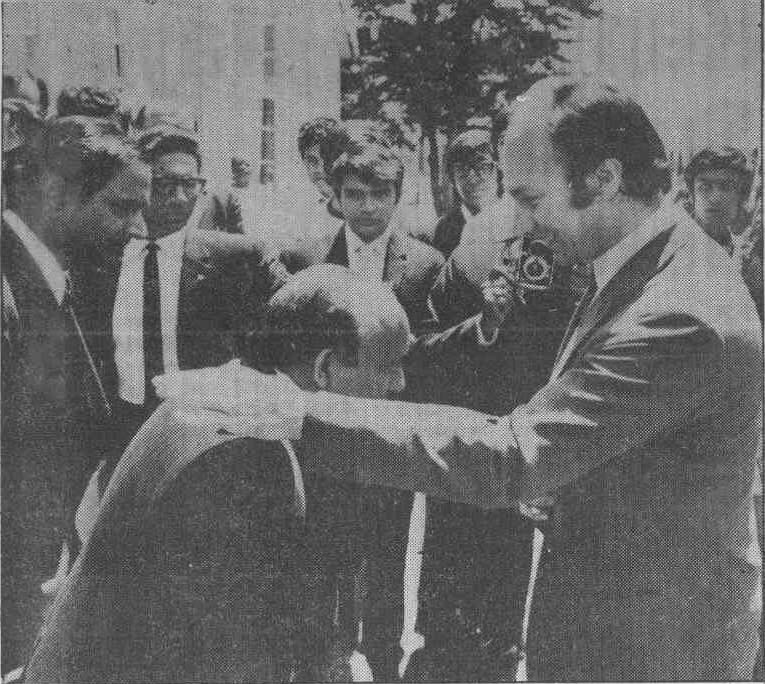 June 1972: Visited Paris Jamat. Mowlana Hazar Imam with the Executive Officers, Uganda Volunteers. 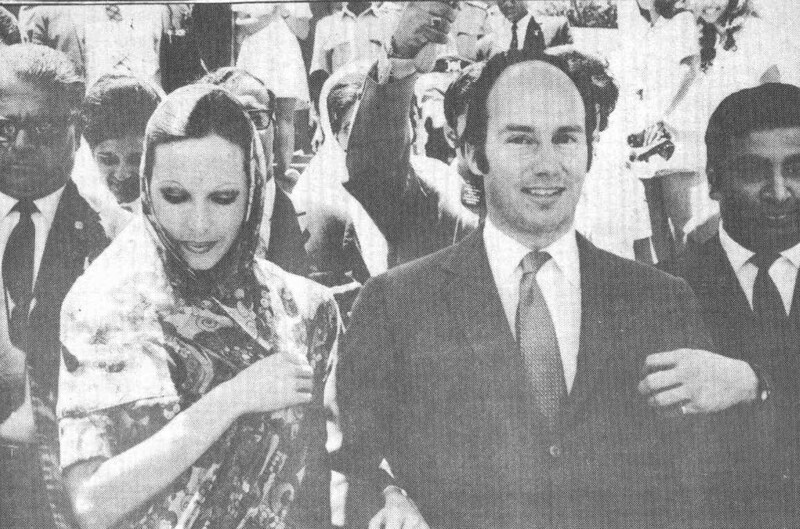 Mowlana Hazar Imam and Begum Salimah enjoying the summer in Sardinia, on their yacht, "Amaloun"
Mowlana Hazar Imam and Begum Salimah arriving for Deedar in Nairobi J.K.
Mowlana Hazar Imam in entering Nairobi J.K.
Mowlana Hazar Imam and Begum Salimah at the Nairobi airport. 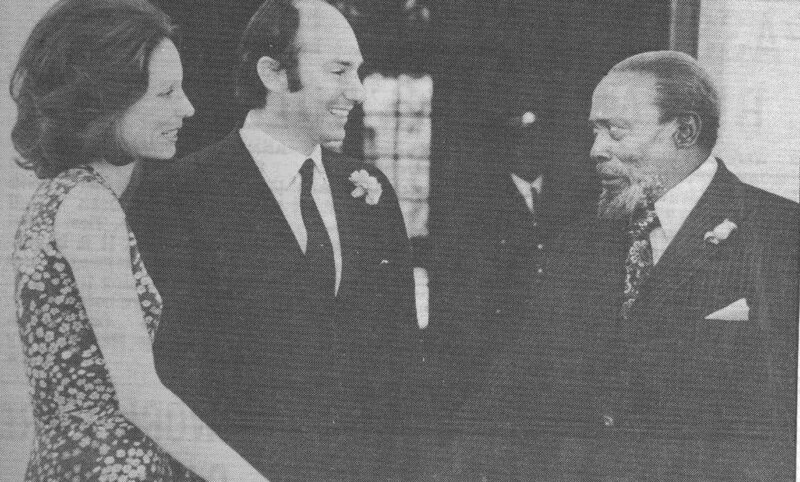 Mowlana Hazar Imam and Dr. Mungai caught in a happy mood during the reception. 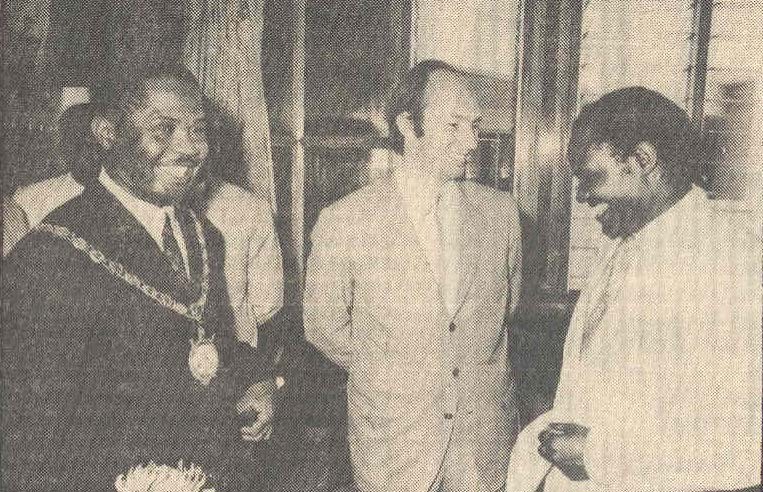 Mowlana Hazar Imam declared open the Fairview Hotel at Kampala and said "Tourism has a very big future in this country." 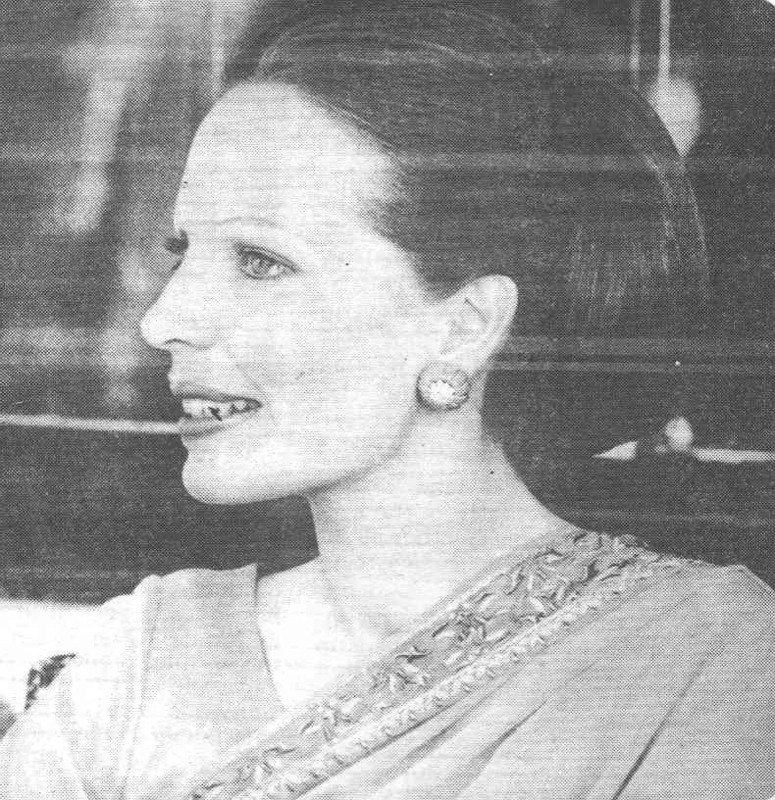 (The mounted tusks were presented to Their Highness by Sherali family as wedding gift. Mowlana Hazar Imam laid the foundation stone of the Fairview Hotel extension. 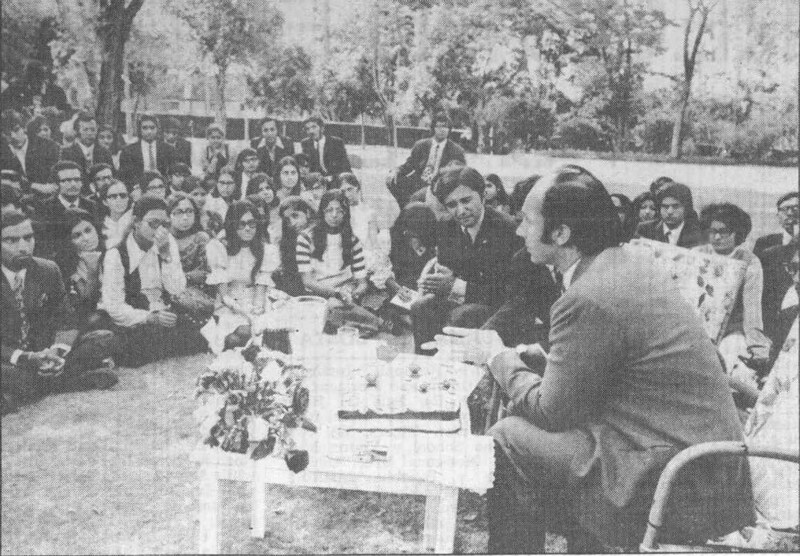 Mowlana Hazar Imam speaking at the opening of I.P.S. Building Kampala. 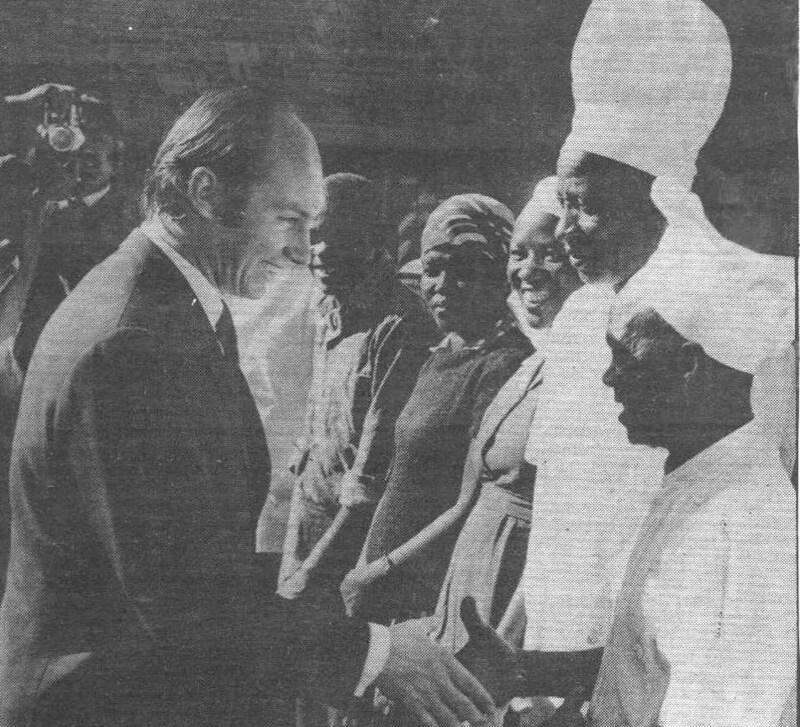 Mowlana Hazar Imam, Prince Amyn and Begum with the President of Uganda Idi Amin at the I.P.S. function. 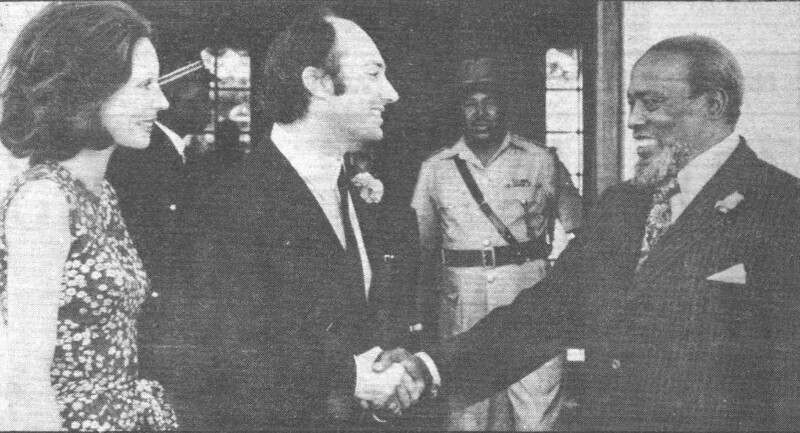 Mowlana Hazar Imam being received by President Amin at Kampala Lodge. 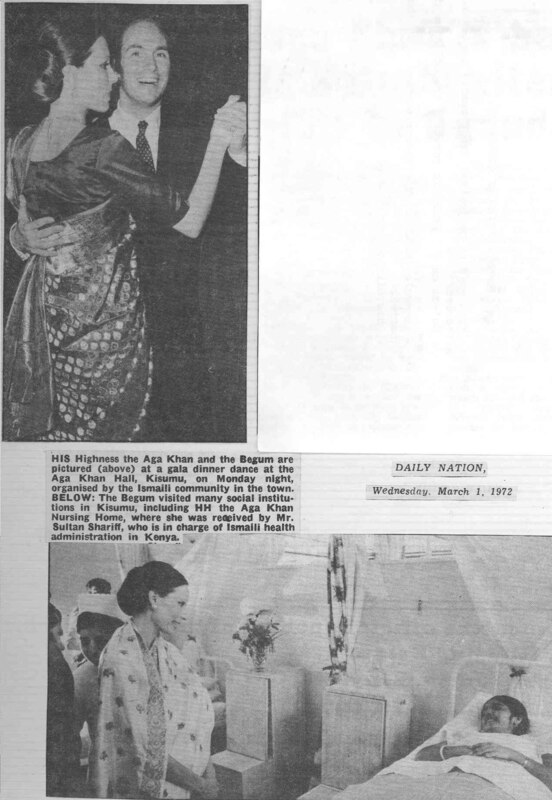 His Highness the Aga Khan and the Begum are pictured at the gala diner dance at the Aga Khan Hall, Kisumu, organised by the Ismaili community in the town. 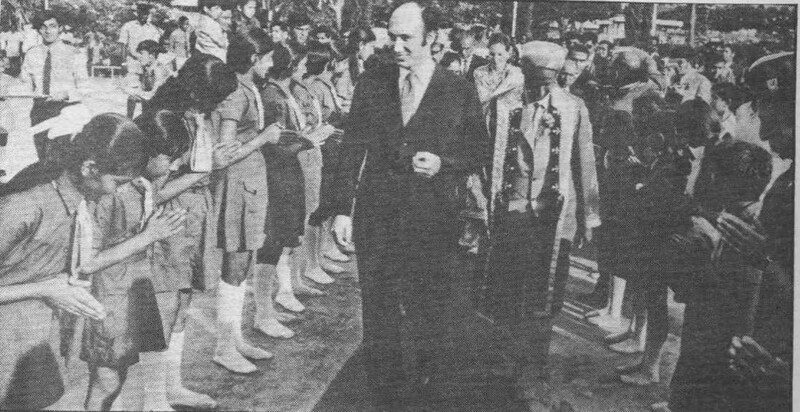 The Begum visiting Aga Khan Nursing Home. Begum Salimah watches young Sultan Darvesh conduct a chemistry experiment at the Aga Khan Academy. 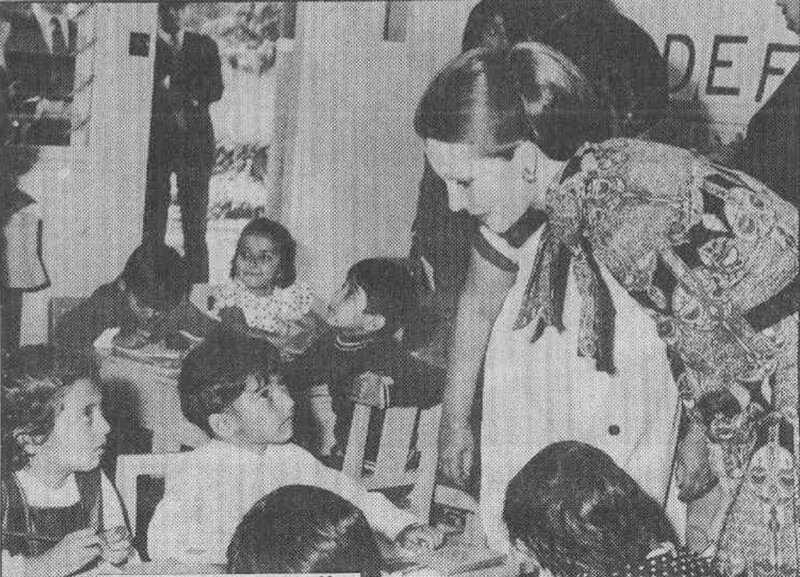 At the nursury, the Begum inspects the work of some little ones. 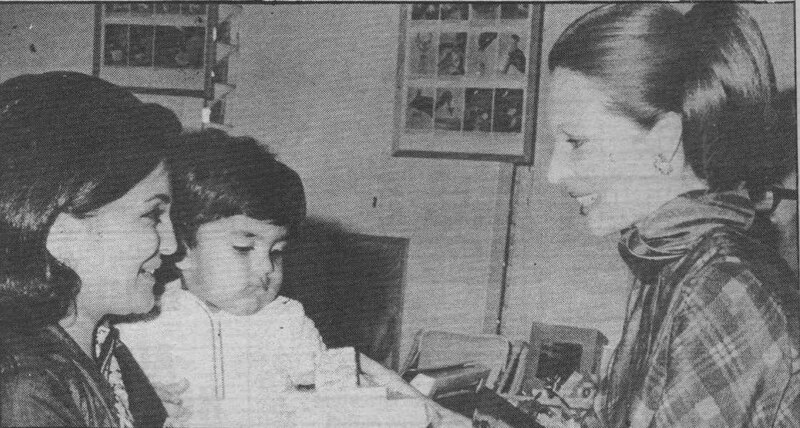 The Begum is pictured in the deaf and dumb children's class at Aga Khan Primary School where lessons are conducted by means of electronic devices. 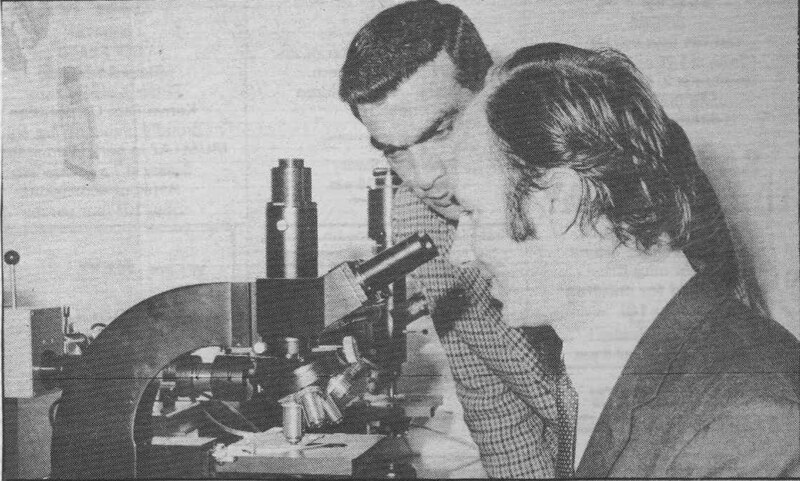 His Higness the Aga Khan is being explained the latest microscope, which is used in the research of cancer. Begum Salimah presents a prize to Mrs Noorjehan Virjee, whose baby, Farid was one of the winners at a recent baby show. Begum Salimah presents the trophy to the winner of a baby contest. 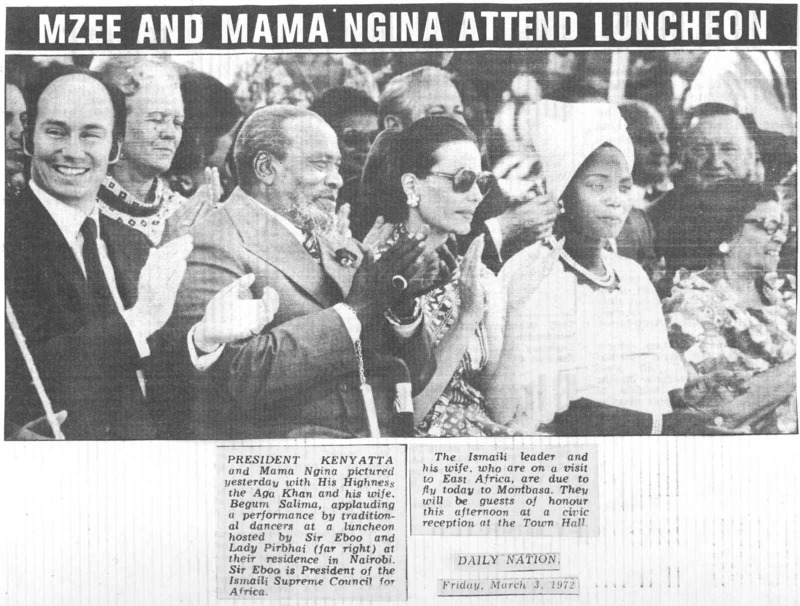 Aga Khan and Begum Salimah with President Kenyatta at luncheon, in Kenya. 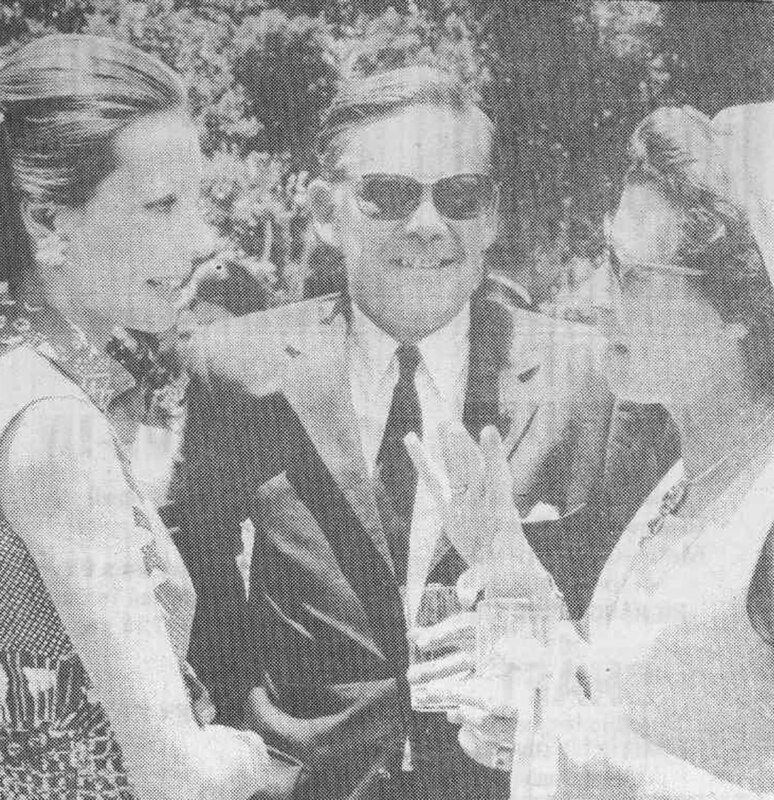 Begum Salimah with Canadian High Commissionner Cooke and Mrs Cooke, at luncheon, in Kenya. 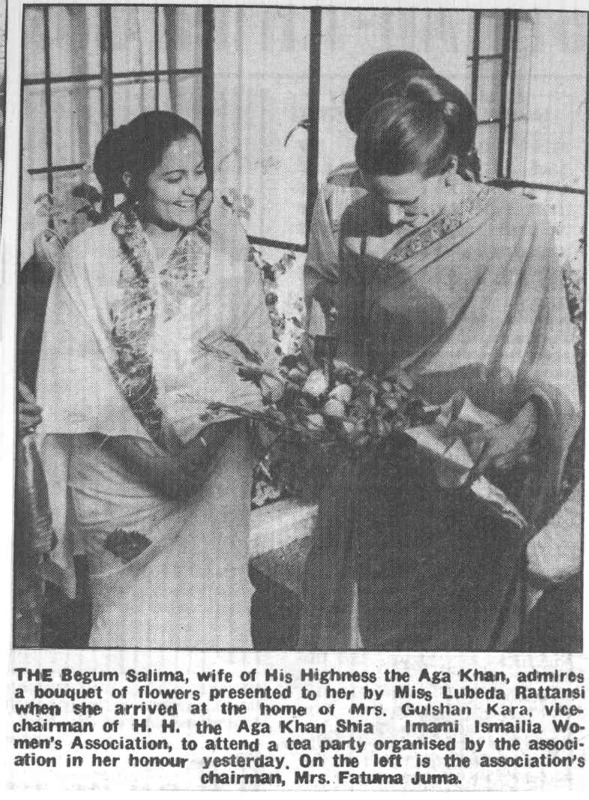 Begum Salimah with Fatuma Juma. 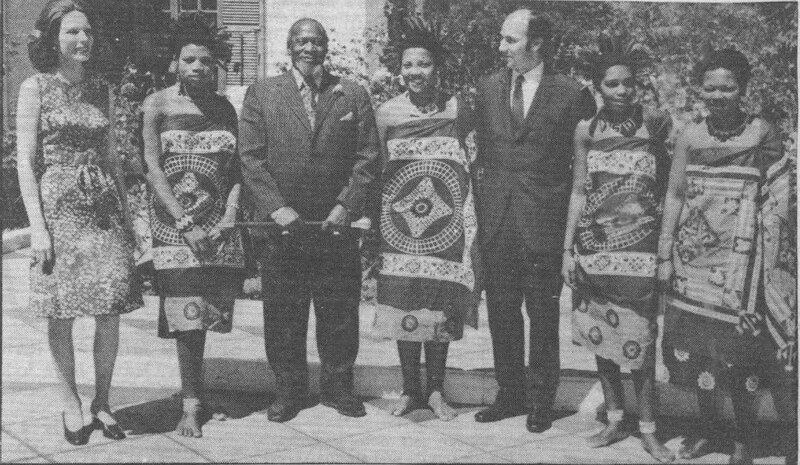 Hazar Imam and Begum Salima with President Kenyatta, Princess Sabisile (daughter of King Sobhuz II of Swaziland) and 3 other Swazi Princesses. 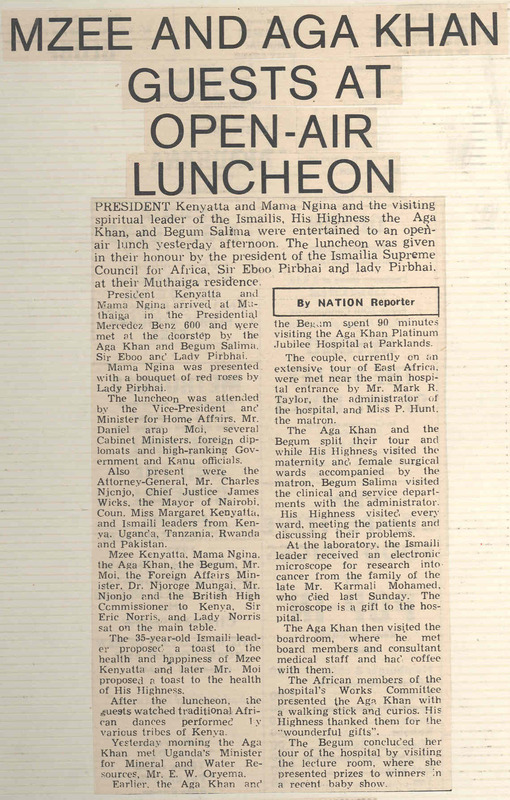 President Kenyatta says farewell to the Aga Khan and Begum Salima. 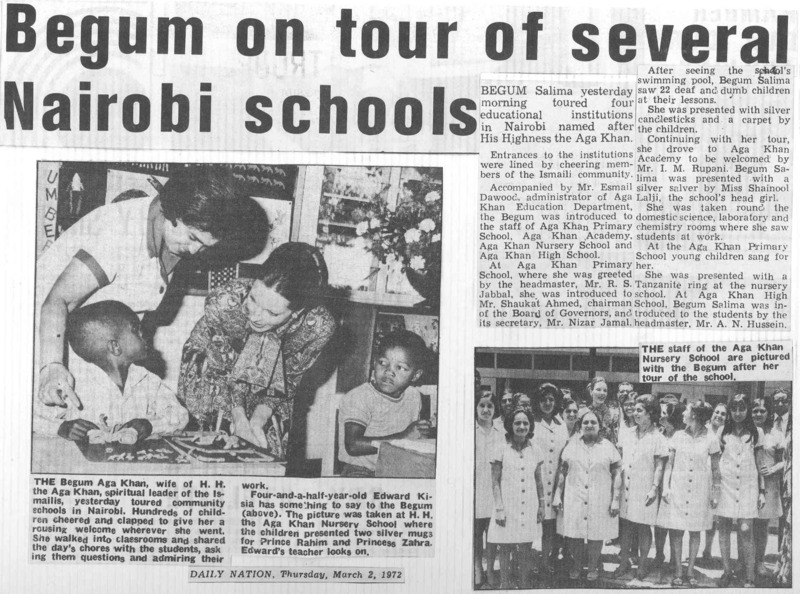 Begum Salima shakes hands with President Kenyatta. 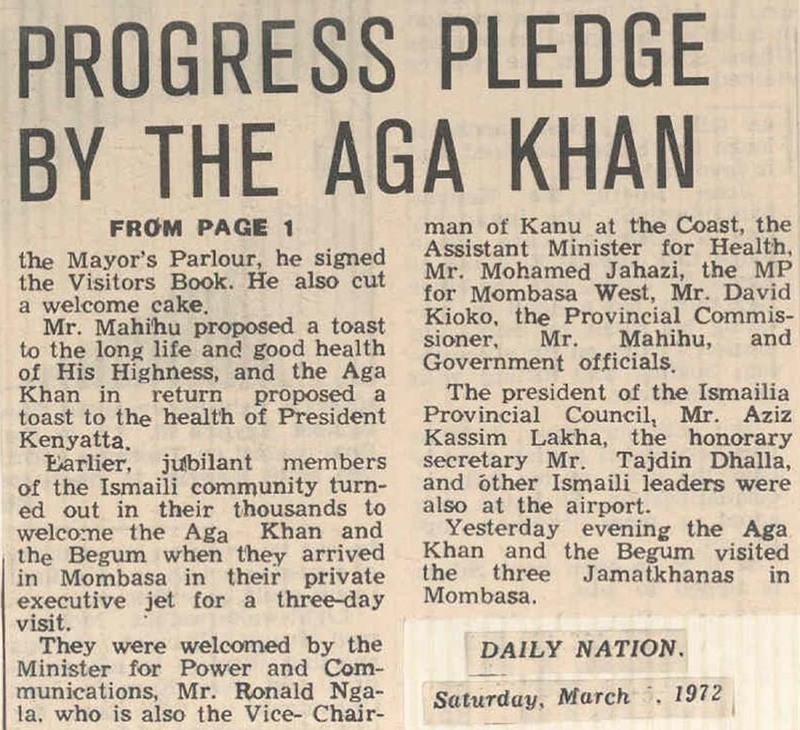 President Kenyatta bids "Kwaheri" to Aga Khan in Nairobi. 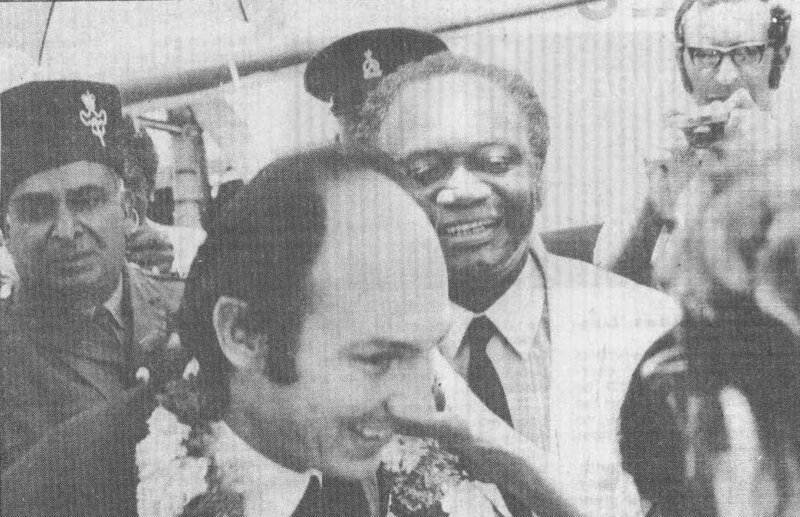 Hazar Imam is garlanded when arriving at Mombasa, Kenya. Hazar Imam is being welcomed by Mr. Ronald Ngala, Minister for Power and communications at Mombasa airport. 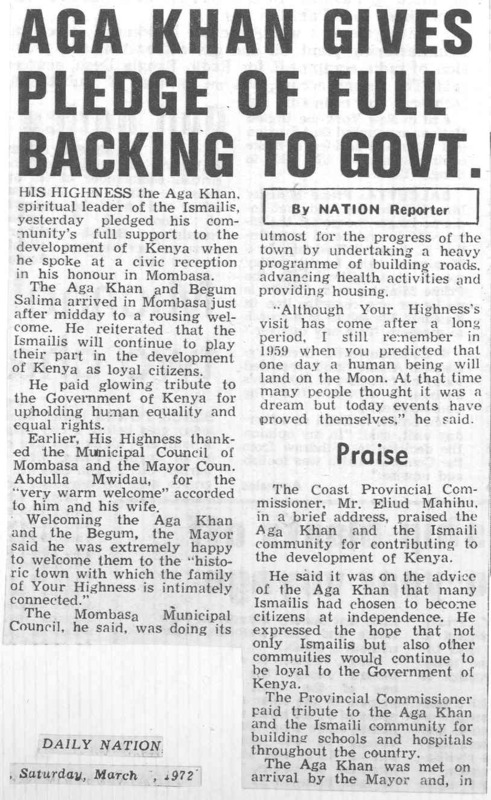 Hazar Imam with the Mayor of Mombasa, and the Coast Provincial Commissioner. Hazar Imam and Begum with Sir Eboo. 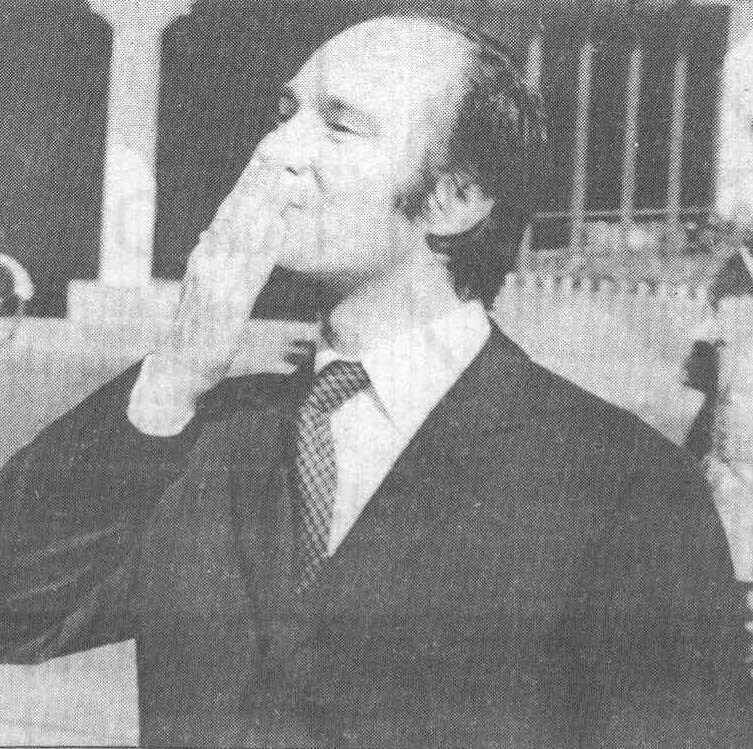 Hazar Imam blowing a kiss to the Begum a she flies off for Switzerland. Hazar Imam visiting Fort Hall Jamat Khana in Mombasa, Kenya with Mukhi and Kamadiya. 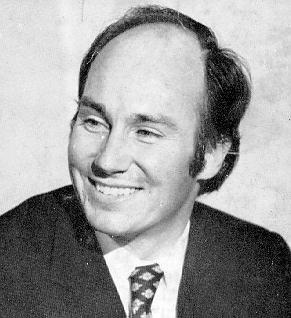 The Aga Khan speaks to university students in Nairobi, Kenya. Hazar Imam bids farewell to some members of the domestic staff at Sir Eboo's residence. 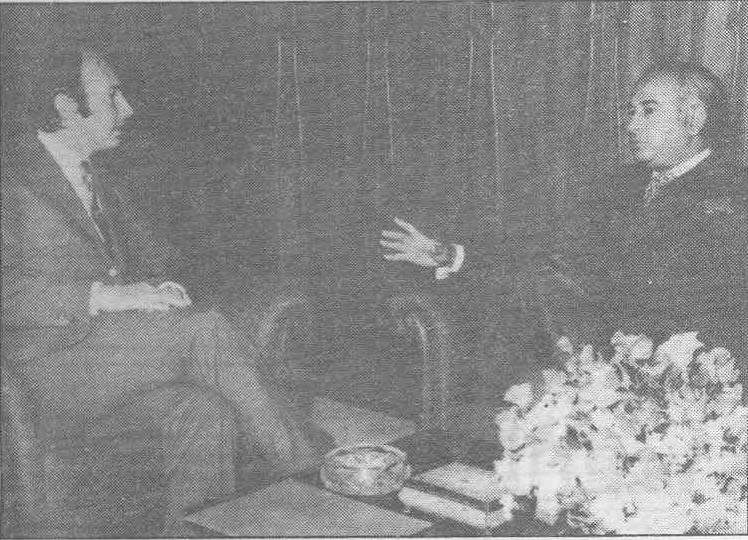 Hazar Imam is pictured in conversation with President Ali Bhutto of Pakistan. 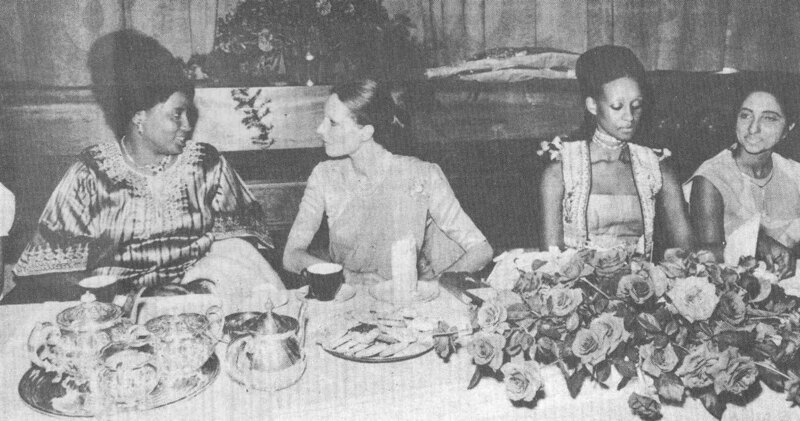 Begum Salima chats with the first lady of Uganda, Mrs Amin, during the tea party in Kampala organised by the Ismailia Women's Organisation in honour of Begum Salima. 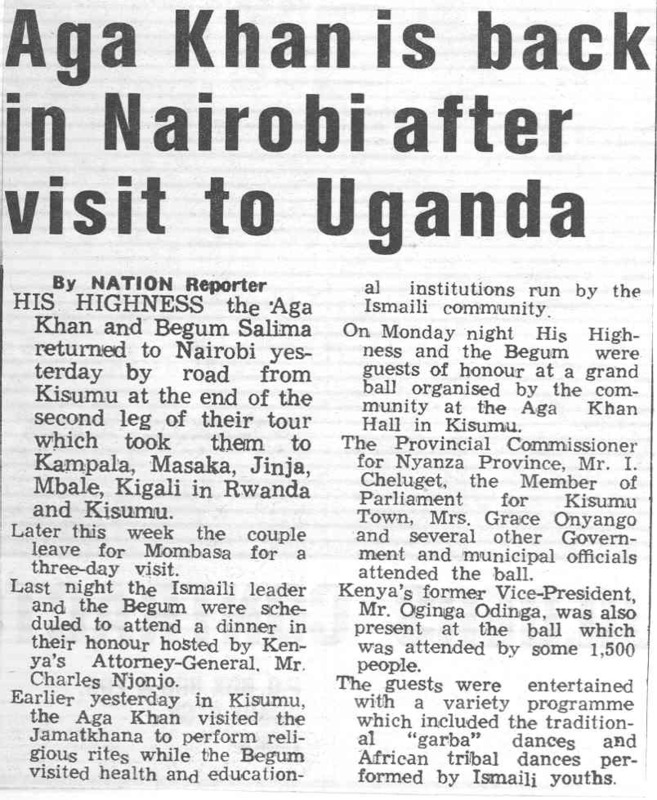 Hazar Imam and the Begum arrive at a dinner engagement during their stay in Kampala. Hazar Imam is arriving to open a new Jamat Khana at Mbale in Uganda. Hazar Imam with Mr P. K. Boit the Kenyan Western Provincial Commissioner.